*cracks the whip* Why aren’t you writing?! This is a pretty timely post for me because one thing I have been struggling with for about a month now is motivation. It’s mostly a medical thing this time around, as sometimes new medication messes with the brain, but in the past I have not been immune to periods where writing is like pulling my own teeth for no other reason than I Would Simply Rather Stare at a Wall. This should go without saying. You might have lost motivation because you are looking at your work-in-progress with too critical an eye. Or you are suffering from burnout. Or you have undergone a lot of stress in your personal or professional life. Whatever the reason, taking a break is an easy way to gather your bearings and reassess what you are writing. You can use this time to daydream, address problems in your life that might be impeding your progress, or go on a vacation. The trick is to avoid taking a permanent break, or else this method fails. Make a plan — aim to return to your WIP by a certain date, if you can. Vent to someone you trust about the trouble you are experiencing. They will most likely respond with encouragement and assurance that you are not a failure, that you will get better, and that they love what you do. Encouragement like this can remind you why you started writing in the first place. Don’t lose sight of the initial dream. Pick up a book (good or bad) and read. For me, reading a good book feels like a massage on my brain and can help me remember what words are. Sometimes words in my head become scrambled after writing consistently for a long period of time due to fatigue, and I lose motivation because I am too exhausted to form a coherent sentence. Reading a bad book makes me think my writing isn’t that dreadful. The thought, “I can do so much better,” is a powerful motivator. As conceited as that sounds, it at least restores the faith I once had in my abilities. As a bonus, regardless of what you read, the potential to absorb ideas of what works and what doesn’t in a story (fiction or nonfiction) is always there. Don’t underestimate the power of reading, especially when you lack motivation to write. On that note: don’t negatively compare yourself to your ideal. Don’t look at authors you admire and lose hope that you could ever be like them. You don’t necessarily want to be like them. What you really want is to become an ideal, your own success story, and mimicry alone cannot lead to that end. Read a a dozen or more success stories, and odds are you will never find two that are alike. Cut yourself some slack. Unless you are writing at gunpoint or under some legally-binding contract, you don’t have to finish your project. If necessary, review what you’ve written, take what is valuable, and burn the rest. Grab a fresh sheet of paper or open a blank document and start over. I recently did this to my 160,000-word draft about 15 chapters from completion. I lost my motivation to finish it due to mental problems, fatigue, and new ideas to improve it, so I decided to open a new document and start over, using the good ideas from the first draft and inserting improved concepts in the second. 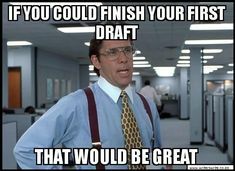 (Note: I didn’t delete my unfinished draft! That would have been unwise!) My motivation is back! It’s a miracle! Don’t imprison yourself or constrain your creativity. You can give up your current project in favor of something better if you wish. It’s entirely your prerogative. And it might save you a bit of time. I didn’t want to leave my first draft incomplete, but in order to get out of a rut I had to stop, think, and start again. I didn’t abandon the story, although that may be necessary at times if the story simply isn’t working for you. My new goal is to finish a better version of it. The end result is all that matters. The journey varies by individual. What do you think? How have you regained motivation in the past? Let me know if any of these tips help you!